Today's headline news around the world is without doubt the UK General Election result. Many blog writers, Twitter and Facebook members are busy jamming up the web with their take on the situation .... quite understandable perhaps BUT I would rather write about voting of a different kind .... a vote for vanilla ice cream! 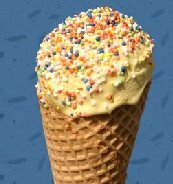 Yes, when the rest of the world goes mad about politics, I find the thought of ice cream very appealing and somehow comforting. So earlier today, in a telephone conversation with a complete stranger, I asked what they would vote for as their favourite ice cream flavour. Quite a remarkable reply .... why? Well, vanilla ice cream is also #1 in my book, it is also the most popular ice cream recipe downloaded from my website (see the statistics for 2009 on my top 10 ice cream recipes page) AND one of my favourite photos of ice cream featured throughout my ice cream recipes website is of .... a vanilla ice cream cone with hundreds and thousands sprinkled on it! See the photo left. In talking further with Lee, he revealed that was brought up enjoying Laurel and Hardy movies - a love he shared with his late father. Another coincidence, as my late father had the same influence on me! So here for you Lee is a Laurel and Hardy ice cream scene. ENJOY!